College is expensive. This past school year, private colleges averaged about $33,000, and public colleges averaged just under $25,000 in tuition. As we all know, these prices have been rising for years. Now, Americans owe over $1.4 trillion in student debt. Medical school is even more expensive. Try $35,000 to $59,000 per year, on average. When young students graduate college with six-figure debt, the last thing they want to do is add more. As a result, there is a very real possibility of a huge shortage of doctors in the near future. The shortage is currently estimated at 90,000 by 2025. This means that doctors’ offices will be understaffed, and patients will have to wait longer to be seen. The longer a patient has to wait, the longer their injury or illness intensifies. This is obviously not the ideal scenario, but luckily, it’s in the process of being fixed. That’s where medical robots come into play. This is a rapidly growing industry that’s expected to triple in the next four years. 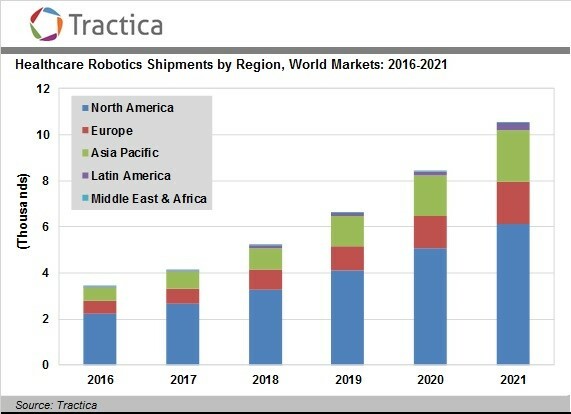 Tractica, a market intelligence firm, expects there to be over 10,500 medical robots shipped out in 2021, a huge increase from the estimated 3,400 shipped last year. The duties performed by these robots right now are very basic. But down the road, these robots could make up for what will likely be a shortage of workers in the medical field, especially in surgery. Another key benefit of robotic surgery is there will much less medical malpractice and fewer botched surgeries. The robots can only do what they are programmed to. Not only does the surge of medical robot technology make up for the coming doctor shortage, it gets rid of human error, which accounts for hundreds of thousands of deaths per year.